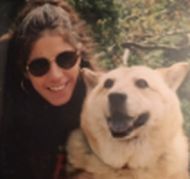 Stephanie LaMotta is the founder of Death Row Dogs Rescue. Her first rescue was in 1984, and it was a horse. Then she noticed a stray dog hanging around the stable and trying to go home with her, and that became her first dog rescue. After that, stray dogs kept finding her, and Stephanie began contacting friends and placing ads to find foster and adoptive homes. When she saw dogs in dangerous situations, she called Animal Control for help, and that was how she became aware of the number of homeless dogs being euthanized. She started rescuing them from “death row,” and Death Row Dogs Rescue got its name. .
For the first 20-plus years, DRDR was entirely self-financed. Stephanie is the daughter of boxer Jake LaMotta, and she earned a comfortable living teaching boxing. After basic living expenses, all her income went to saving animals. In addition to dogs, Stephanie has rescued cats, fish, birds, pigs, horses, goats, sheep, and chickens. To date, she has rescued about 3000 animals. In approximately 2009, DRDR became a 501(c)(3) charity, so the organization could accept donations. Stephanie made contact with animal rescue organizations and participated in adoption events for many years. However, she has multiple sclerosis, and as her disease progressed and she became confined to a wheelchair, she could no longer attend. DRDR depends on people willing to foster or adopt. When they run out of foster homes, they have to rely on boarding kennels, which are expensive and not ideal for the animals.